Fourth in an occasional series on how Harvard researchers are tackling the problematic issues of aging. The morning light is pouring into the senior living community in Canton, where six residents are performing an exquisite choreography of sweeping, lyrical movements, emulating their Tai chi instructor. “Wave hands like clouds,” urges Kerry Paulhus, leading them in the classic low-impact and slow-motion exercises of the ancient Chinese martial art. With relaxing music playing in the background, the students shift their weight from one leg to the other, turn their waists, and rotate their arms as if they indeed were clouds. When class ended, Elaine Seidenberg and Fran Rogovin, both 84 and close friends for four years, were glowing. While Tai chi may offer senior practitioners inner peace, scientists also value it for its fundamental, physical benefits. In addition to improving balance, flexibility, and mental agility, it also reduces falls, the largest preventable cause of death and injury among older adults. One way to help the aging have long and vital lives, researchers say, is to help protect them from injuries or worse. According to the Centers for Disease Control and Prevention, one in three older adults falls dangerously each year. In 2014, about 27,000 older adults died from falls, more than 2.8 million were treated in emergency rooms, and 800,000 were hospitalized. 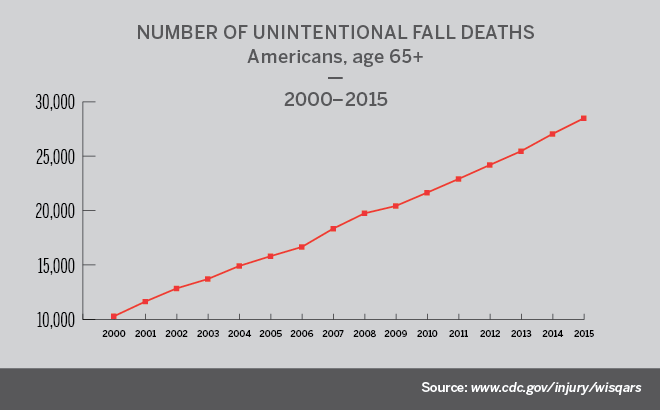 Falls are the leading cause of death among adults over 65, and the death rate from them has soared in the past decade. Over more than 30 years, researchers at the Institute for Aging Research have been studying what causes these falls among the elderly, and how to prevent them. The institute was started at Hebrew SeniorLife 50 years ago to take advantage of the proximity to senior residents living nearby, said Lew Lipsitz, institute director and chief academic officer. Hebrew SeniorLife, a senior health care and housing organization affiliated with Harvard Medical School (HMS), serves 3,000 seniors in nine residential communities throughout Boston. One of a kind, the Harvard affiliate is the only long-term chronic care teaching hospital in the United States. The resulting access by researchers to seniors and their everyday lives provides a major boost to the real-time value of their research. When Lipsitz began working at the institute in 1980 as one of the first Harvard fellows in geriatric medicine, he noticed that many residents fell frequently. His area of research was born. Lipsitz directs the institute’s Center for Translational Research in Mobility and Falls. 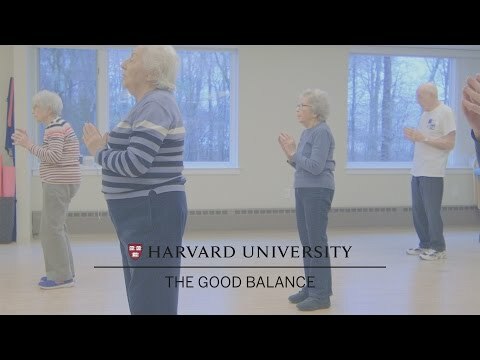 The center has led a number of groundbreaking studies on reducing the risk of falls among older adults, ranging from the benefits of Tai chi, to the role of high blood pressure in falls, to the use of electrical stimulation to the brain to aid executive functions, to the benefit of vitamin D to increase bone density. Many of these studies over time were funded by the National Institute on Aging of the U.S. Department of Health & Human Services, and the National Institutes of Health. It’s a simple fact that balance — the ability to maintain the body’s center of mass, located in the chest area, over the base of support or the feet — declines with age. Maintaining and bolstering it requires more than strong bones and firm muscles. “It’s not just a physical task; it’s also a mental task,” said Manor, director of the institute’s mobility and brain function lab, and an HMS assistant professor of medicine. Because Tai chi requires attention, memory, and learning components to master its physical movements, its benefits go beyond improving mobility and reducing falls, the researchers say. It increases cognitive and mental functions and mindfulness. It also promotes social interaction because Tai chi is often practiced in a group setting. In his lab, Manor studies the links between brain function and balance and falls. As part of his research, he monitors movements of participants while they walk and perform other mentally aware tasks such as counting backwards by threes, in what he calls a “dual-task assessment.” Often, falls among older adults happen when they’re walking while performing other tasks, because they get distracted and lose their balance. Even as research continues, falls remain a major, rising worry. In 2015, the financial toll from falls among older adults amounted to $31 billion, and the costs are expected to increase as life expectancy grows. In 2014, the population of U.S. seniors was 46 million, and by 2030 more than 20 percent of the country’s population is projected to be 65 and older. Beyond the financial costs, falls can dramatically undercut seniors’ lives in ways ranging to dependence, depression, isolation, and loneliness. As for Rogovin and Seidenberg, neither has fallen since she began practicing Tai chi, three and two years ago, respectively. Both live an active life at Orchard Cove. While they also practice yoga and meditation, they rave about how Tai chi has enriched their lives. Seidenberg agreed. She especially cherishes the positive effects on her mental wellbeing. Tai chi not only helps her cope with the stress of dealing with her husband’s Alzheimer’s disease, but it makes her feel better. A study led by Harvard Professor Hopi Hoekstra has uncovered links between the activity of specific genes and parenting behaviors across species, such as close cousins deer mice (pictured) and oldfield mice. "[T]here’s no measurable effect based on who raises [offspring]," Hoekstra said. "It’s all about who they are genetically."